Our TRESemmé Biotin+ Repair 7 7-in-1 Primer Cream is your styling essential, protecting your hair from 7 different types of styling damage, adding shine & making hair more manageable for quicker & easier styling. The intensively moisturising Primer Cream, formulated with Biotin, works overtime to deliver 7 benefits in 1: helps to tame frizz, nourishes hair, improves manageability, reduces breakage, boosts shine, adds a silky feel and even gives protection up to 230⁰c heat. 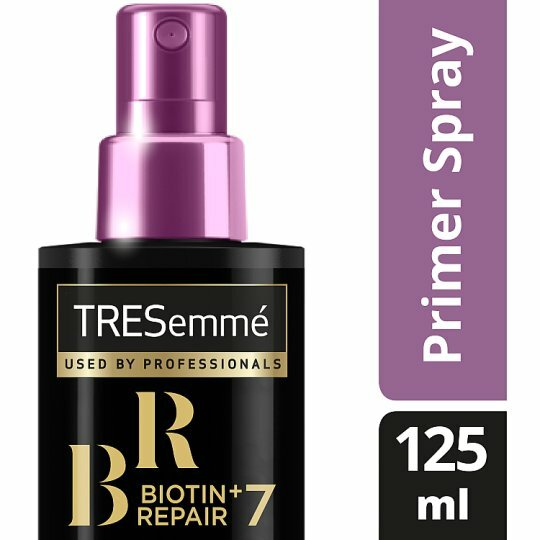 Designed to visibly improve the appearance of damaged hair and protect your hair against daily styling, our TRESemmé Biotin+ Repair 7 7-in-1 Primer Cream ensures your hair is ready, whatever style you want to create! You can blow-dry, brush & braid; bleach, colour straighten & curl. Want healthy looking hair or a smooth style? Have both with our 7-in-1 Primer Cream. How do I use it? After using Biotin+ Repair 7 shampoo & conditioner, apply an almond sized amount (dependent on hair length) of 7-in-1 Primer Cream into your hands and distribute evenly through damp hair with fingers or comb. No need to rinse, style as usual.